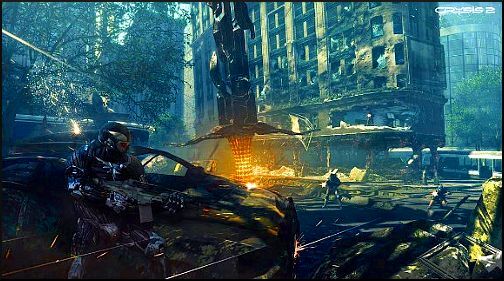 This time round Crysis 2 is set in urban New York City in 2023, which has since been evacuated due to alien invasion, similar to the previous game set 3 years ago, aliens again, they seem easy targets but you will need to run and hide at some points, especially on the Supersoldier difficulty. This new sharp shooter adventure provides freedom to customize weapons and advanced abilities but in more depth and detail. Crytek decided this time round that they wanted to avoid making another game set in a jungle environment as the other series of games Far Cry and Crysis went under this jungle environment, so a whole change was needed and what a difference the scenery has made. As a player of this game you are in control of a Re-con Marine codenamed Alcatraz who is the successor to Jake Dunn, the guy from the previous first game. As Alcatraz, you gain ownership of the of the new Nanosuit 2 sent from Army Delta officer Laurence Barnes, who returns from the original Crysis game where he was Dunn's commanding officer in the Raptor Team previous. CryNet Systems has been hunting the Prophet to retrieve the suit, inadvertently pursuing Alcatraz, believing he is the Prophet. 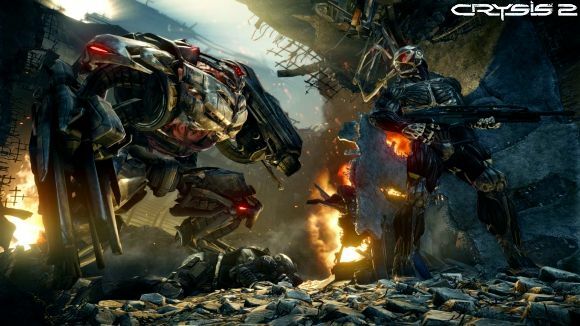 The Nanosuit 2 gives players more freedom and options in difficult situations on the battlefield as Crytek has tweaked the original Nanosuit, now called the Nanosuit 2, very well advanced and created by the fictional CryNet Systems company. The suit functionality has been streamlined, multiple modes can easily be used simultaneously whenever the player wants to change them. This is decidedly different than the first game, in which the suit was generally limited to a single mode and the multiple modes could not be used simultaneously for more than a second. The first suit's Strength and Speed Modes have been combined into the new Power Mode, the suit binoculars function has been upgraded with an advanced Tactical mode and a Cloaking Device which has been modified to allow increased sensory input and to aid silent stealth kills which has been renamed Infiltration Mode, stealth being my favourite choice. The Armour Mode has been left more or less as it was, with the exception of a constant decreasing energy level when running or energy is used up. The Nanosuit 2 features many improvements over its predecessor, giving soldiers freedom to upgrade, based on their own style of combat and many new aspects of the game make this a strong contender for an all out shooter and defence favourite of all time. Take on some of the larger enemies, but prepare to hide on the Supersoldier difficulty. The game begins with some news footage of ecological disasters, and a large outbreak of the Manhattan virus, a gruesome disease that causes complete cellular breakdown, civil unrest and panic around the alien invasion by the Ceph, a squid-like alien race behind the incident of Crysis originally. Due to the breakdown in social order within Manhattan, New York City is placed under Martial Law and under contract from the US Defence Department, soldiers from Crynet Enforcement & Local Logistics or CELL, a private military company run by the Crynet corporation who police the chaos throughout the story. This first impression of Crytek�s outing on the urban streets being a shooter genre feels great and positive throughout, quite honestly, the developers have thrown every element you could imagine into this sequence of action and events. Both the alien enemies and the marines expertly use the environment for cover and will move to flank you given the opportunity. Most of the encounters are large set piece showdowns with numerous waves of enemies emerging from various places on the maps, which means you have to keep moving, be aware of your environment and use the resources that are available to you. Your Nanosuit 2 proves to be a tactical overlay of important points for caches of ammo, show's potential dangers like a scan icon over where an alien is moving or a heavy alien is patrolling, and even tactical routes to collect ammo, flank or stealth potential enemies. The best part I enjoy about the gameplay itself is if you�re stealthy through an area and you need to find cover you can pinpoint large drains to remain hidden and find your way around the map underground without actually being detected. Once at street level, sneak behind the marines and even some of the aliens as you can perform a swift, silent execution. The bigger Ceph will charge at your position when they spot you, In those cases, hit the armour or stealth power-up and go in guns blazing to finish off there attack or you can even grab the smaller aliens and then throw them at walls for an amusing quick kill. When you down any aliens a great feature of the game is to collect samples, this is done by walking over the dead enemies and collect the spores to upgrade your Nanosuit 2. The Controls are fairly easy considering alterations to the game but the grenades can be forgotten as you need to double tap the Y button to select these at some point, I actually forgot about grenades and thought at some points along the beginning of the game that I needed to remember how to select them. Throughout the game there is points where you use vehicles, drive tanks, have fun with the RPG, grab the turret guns, plant C4, sneak around, snipe those heads off from distance and even jump from great heights, not forgetting the air stomp trademark, and let hell loose with the weapons available, a truly amazing experience throughout combined also into the Multiplayer online, which is I think in a league of its own. Upgrade the Nanosuit 2, advanced Weapons on Single & Multiplayer Mode, enhanced upgrades. Its no surprise that Crytek's graphics look great, the area's within the game are crystal clear and sharp, some of the areas are reused along the game but I don't think too many players would spot that. The amount of space used and the scenery is one of the best visual games I have ever been on, there's no freezing or game lag that I experienced after completing the Supersoldier level also. The special effects like the armour honeycombs and the stealth cover is great, special parts of the game also where there is fire and water are finished to so much detail, like the water droplets on the visor which shows on the screen without impairing your vision, a real pleasure to move around within any part of the game. I think that the great Graphics in the game is due to that fact that the game was split up between Crytek Frankfurt doing the visual work on the singleplayer mode and Crytek Notts UK looking after the Multiplayer section both individually, first class job throughout. If you pause the game and hear the music or just change to stealth mode or some other setting on your Nanosuit 2, you will see what a small grudge I have against the sound on this game. It's hard to decide if the sound designers intended to or deliberately incorporated some of the most annoying sounds known to us at some points of the game or whether it was intentional to use the inexplicable squeaking noise on the Nanosuit 2 which it makes whenever you melee or throw an object. For some reason, the suit lets out a high pitched screeching sound, which is both annoying and unnecessary, and is one of the strangest complaints I've ever had about an intentional piece of game design. It's a shame, because the soundtrack is great, but the weird audio glitches are really quite noticeable and irritating at times. For such a beautiful, slick game, Crysis 2 really does suffer from a small amount of sound technical issues, none of them ever threaten to break the game but they're still annoying and constantly repeated. Varied Maps in big open spaces, showing excellent Visuals, great colour and Graphic textures. Crysis 2 feels and looks great, great visuals and action all round, from sliding along the road, grabbing and throwing enemies, swimming under water and hiding in all the scenery, breaking explosions, great weapons and even the artificial Intelligence do as they seem fit, all this combined mostly into the singleplayer mode. The multiplayer is very different from online shooters, giving choice, Rank and Weapon advancements to move up to, very different to similar games, very challenging and enjoyable most of the time. Its all here in a game that is never boring, except for the annoying pause menu music and that guy who says �armour activated� or something along those lines, when your changing your Nanosuit options. Really, is that small sound going to annoy you that much? I don't think so. What an outstanding game though, probably one of the best games I have ever played in the last two years, awesome Crytek well done guys, I'm going to give the game an overall rating of 9.5/10.